For refuse vehicles and other vehicles where operatives are working around the vehicle. 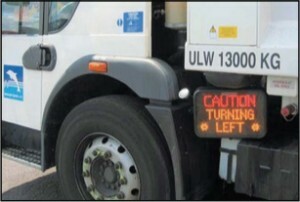 For large vehicles in urban areas to give extra warning to cyclists that the vehicle is turning left. 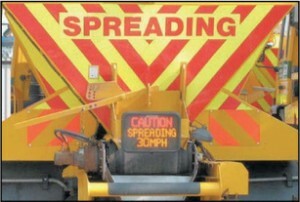 For salting/gritting vehicles to warn other road users of the spreading in progress. Also available: Caution Slow Vehicle, Caution Wide Load, Caution Working Vehicle, Danger Do Not Overtake. Reversalert complies with CISPR specifications for class A equipment. It comprises of a heavy-duty rubber box measuring 450w x 280h x 70d. It is totally water-proof, maintenance free and made from very rugged materials to meet the demands of everyday use. The system uses a very high visibility LED flashing display. Reversalert will display any message up to 8 characters long on 3 lines.